The first sighting of atoms flying in formation has been reported by physicists at the Department of Commerce's National Institute of Standards and Technology (NIST) and the University of Colorado at Boulder (CU-Boulder) in the Aug. 13 issue of Physical Review Letters. * While the Air Force and geese prefer a classic "V," the strontium atoms—choreographed in this experiment with precision laser pulses and ultracold temperatures—were recorded flying in the shape of a cube. These colorized images show strontium atoms forming a "cube" as the frequency of laser light used to manipulate them changes. In this (first) image, atoms become visible at the eight corners of a cube. These colorized images show strontium atoms forming a "cube" as the frequency of laser light used to manipulate them changes. In this (second) image, atoms also appear at the midpoints of the lines forming each cube face and begin to appear at the center of each cube face. These colorized images show strontium atoms forming a "cube" as the frequency of laser light used to manipulate them changes. In this (third) image, atoms appear at the corners, as well as at the midpoints and more clearly at the centers of each cube face. This "really bizarre" behavior is believed to occur with all atoms under similar conditions, says physicist Jun Ye of NIST, who led the research at JILA, a joint institute of NIST and CU-Boulder. Ye is also a faculty member of the CU-Boulder physics department." Atoms have not previously been seen flying in formation, says Ye. Strontium's unique physical properties make the observations possible. In particular, the configuration of strontium's electrons and the resulting atomic properties allow it to efficiently absorb laser energy in two very specific "resonant" wavelengths—a strong resonance at a wavelength of blue light and another, much weaker resonance for longer-wavelength red light. This makes strontium a promising candidate for a next-generation atomic clock based on optical rather than microwave frequencies, and is the reason the JILA team is studying the atom's quantum behavior (see "Next Generation Atomic Clocks"). The experiment was conducted with a dense gaseous cloud of 100 million strontium atoms. The atoms were held in the center of a vacuum chamber with both a magnetic field and six intersecting laser beams, in three sets of facing pairs aligned at right angles to each other. The atoms, which were very hot initially at 800 Kelvin (980 degrees F), were trapped with the magnetic field and blue laser light and cooled to 1 milliKelvin. Then with red laser light, the atoms were rapidly cooled further to about 250 nanoKelvin (almost absolute zero, or minus 459 degrees F). At this point, the magnetic field was turned off, and the red laser beams were tuned to a slightly higher frequency than strontium's weak, red resonance frequency. This caused the atoms to fly apart in cubic formation. 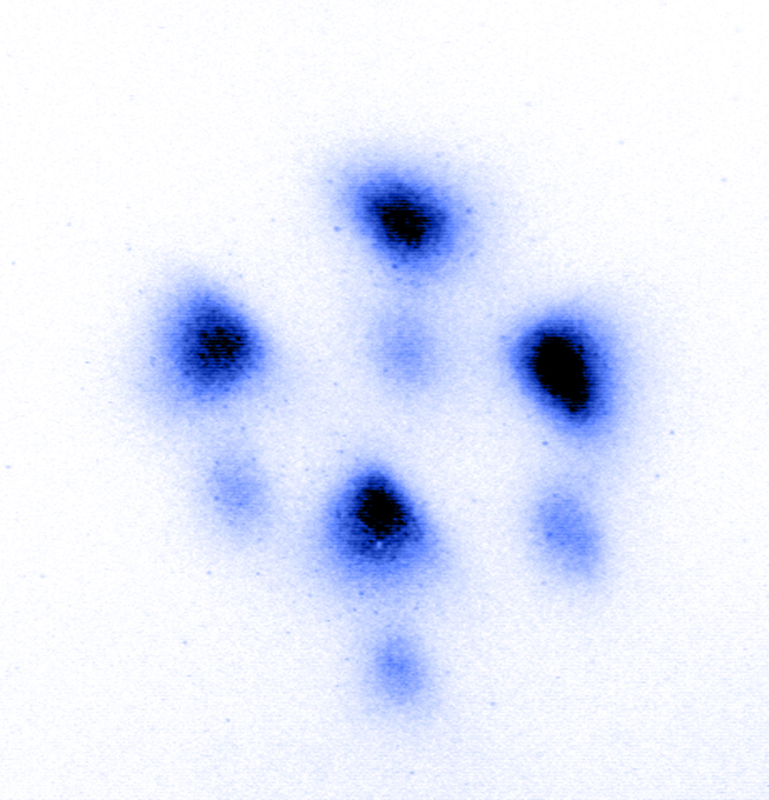 The shape was observed in a series of images (see graphic) by hitting the atoms with blue laser light. The atoms absorb the laser energy by shifting an outermost electron to a higher energy orbit but then very quickly decay back to the lower energy state by re-emitting blue light. Even though different atomic packets are flying away at different speeds and directions, the strong blue fluorescence signals emitted from the atoms can be recorded with a camera, and all of the atoms can be visualized at the same time. The flying structure was created in part by a recoil effect—the momentum kick received by the atoms as they absorbed or emitted each particle of light, or photon. This effect is similar to the recoil received when shooting a gun, Ye says. When an atom absorbs photons from a laser beam, it is pushed in the same direction as the incoming beam. The Doppler effect—the same reason that a train's whistle sounds lower as it moves away from you—causes the incoming laser beam, as the atoms fly away, to appear to have a slightly lower frequency, moving closer to the atom's resonant frequency. Meanwhile, the opposing laser beam appears to have a higher frequency as the atoms rush toward it, and falls farther out of resonance. Strontium atoms very quickly stop responding to the latter beam and fly off in the same direction as the resonant beam. 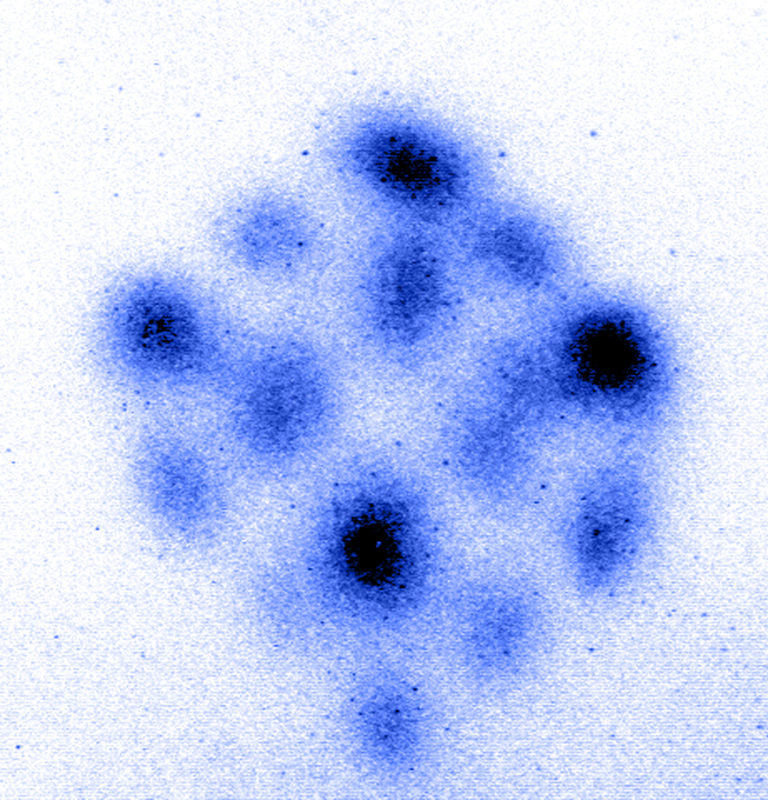 The combined effect of all six incident beams makes the atoms fly away in cube-shaped clusters. 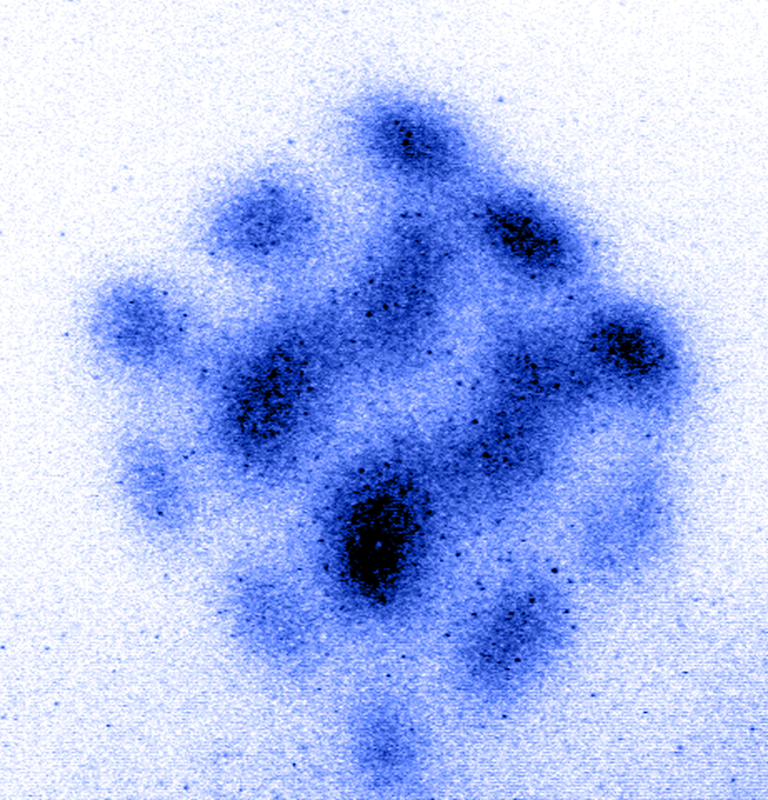 The research team captured images of the atoms flying in clusters at speeds of about 10 to 15 centimeters per second. The cubic arrangement of the atomic clusters changes as the intensity and frequency of the red light varies. The corners of the cube appear first, when the laser light is tuned relatively close to the atomic resonance. As the red light is tuned further above the atomic resonance frequency, atomic clusters appear at the mid-points of all sides of the cube, as well as eventually at the centers of each face. Ye conducted the work and co-authored the paper with JILA postdoctoral research associates Thomas H. Loftus and Tetsuya Ido, and CU-Boulder doctoral candidates Andrew D. Ludlow and Martin M. Boyd. Funding for the project was provided by the Office of Naval Research, the National Science Foundation, the National Aeronautics and Space Administration, and NIST. * Thomas H. Loftus, Tetsuya Ido, Andrew D. Ludlow, Martin M. Boyd, and Jun Ye. 2004. Narrow Line Cooling: Finite Photon Recoil Dynamics. Physical Review Letters 93(7), Aug. 13. Atomic clocks get their "ticks" from the natural oscillations of atoms, a physical property caused by electrons jumping between orbits of various shapes and distances from the nucleus. The international definition of the second, for example, is based on an oscillating frequency in the microwave range for cesium atoms. In simple terms, cesium atoms vibrate back and forth more than 9 billion times a second and this frequency is used as a type of natural pendulum to keep track of time. Strontium's two "resonant" absorption frequencies, on both ends of the higher-frequency, visible radiation spectrum, provide more "ticks" per second and make it a potentially more precise "pendulum" than cesium. An atomic clock based on strontium could be as much as 100 times more accurate than cesium clocks. NIST's cesium-based F1 atomic clock is already so accurate it would have to run for 50 million years before it would be off by one second. Ultraprecise timekeeping is critical to space travel and other precision navigation tasks, telecommunications, computing efficiency, advanced chemistry research and many other fields.